I feel little to no guilt telling you that I LOVE these pancakes! Most mornings, my breakfast includes coffee and either toasted Ezekial bread with SunButter or Avocado Toast. On the days I workout, it’s usually a Superfood smoothie for breakfast. SO when the opportunity arises and time allows for me to treat the family with some amazing pancakes, then I’m going to jump on that! Everything in moderation, right?! These Double Chocolate Pancakes are a perfect breakfast treat to indulge in on a special Saturday morning or extra long weekend. 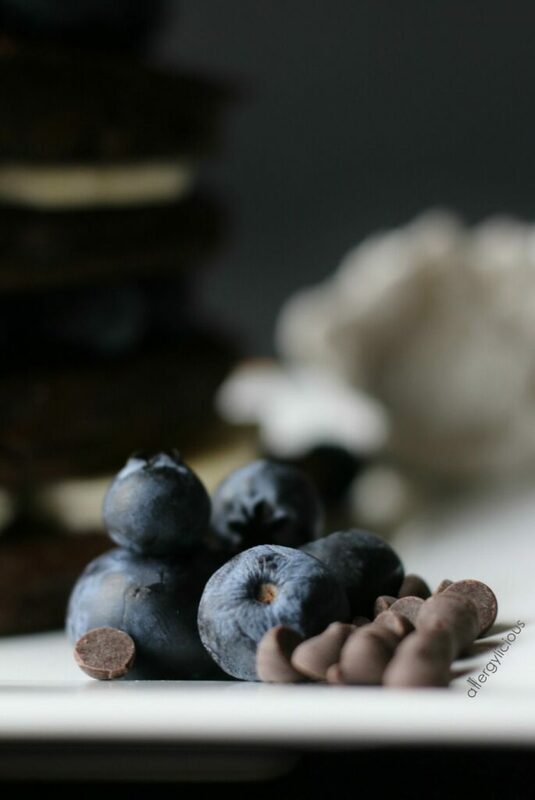 Made with a double dose of chocolate, using cocoa powder and vegan chocolate chips, they are more like dessert than breakfast. But, if you want to be a little more healthy, skip the syrup and serve them with fresh fruit, like berries and sliced bananas then add a scoop of So Delicious Coconut Whip for some extra, guilt-less, dairy-free pleasure. Or stack and drizzle with melted ganache and turn this into a super fun birthday cake. Everyone will think you are just the coolest and most creative mom there is! Regardless of how you choose to top off, this Double Chocolate Chip recipe is simple to whip up, without the use of a hand mixer so even the little one’s can help in the kitchen! 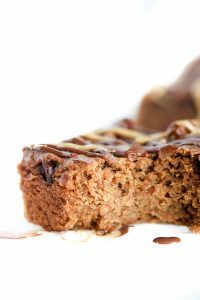 In a large bowl, sift together the dry ingredients EXCEPT the chocolate chips, and leave a well in the center of the mix. In a small bowl, whisk together all wet ingredients, starting with 1/4 cup liquid then add more if necessary. Pour the wet into the dry and mix a little. Add in the chocolate chips and continue mixing completely. (If you are like me, I put all dry ingredients in my Kitchen Aid, then add the wet into it and using the paddle attachment, mix together). Lightly spray your griddle and add approximately 1 Large ice cream scoop of batter into prepared iron. (1/4 cup). If your pancake batter is thicker (which is good), just spread it out a little to make a prettier circle. Cook until small bubbles start to form on top then flip and cook an additional minute or 2. Place in bakeware and set in the oven on “warm” as you continue with the rest of the batches. Plate them up and serve with your favorite toppings! Fresh sliced fruit, Earth Balance butter, syrup, fresh fruit, powdered sugar, or even fruit jam! I originally made this recipe using All Purpose Unbleached Flour which is an option if you can include gluten in your diet. If you do not have plain yogurt on hand, substitute with vegan sour cream or So Delicious Coconut Whip. I have used both on 2 different occassions and each recipe turned out just as fabulous. Feel free to add a little more liquid to the recipe, depending on the type of cream you use above. Although our home is dairy-free due to food allergies, I wish I would have done it sooner. Because of that, I want to ask you to JOIN our family for the 21-Day Dairy-Free Challenge and see how much better you feel because of it. With so many great-tasting options, So Delicious Dairy Free makes this challenge, well, not much of a challenge. 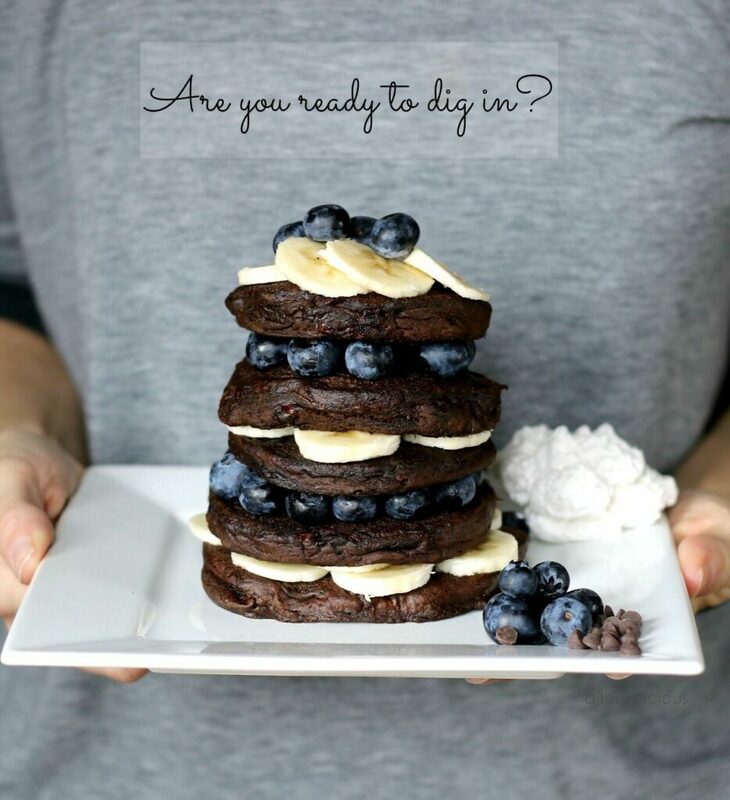 It’s deliciously easy and you can start it off with this Double Chocolate Pancake recipe. It’s just a glimpse into how delicious dairy-free can be! 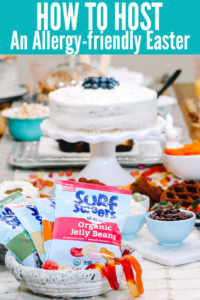 Be sure to follow Allergylicious on Pinterest to access all the best Dairy-free & Allergy-friendly recipes. In addition to Pinterest, you can follow Allergylicious on Facebook, Instagram and even Twitter. Tag #allergylicious with your awesome remakes and include #Dairyfreechallenge for the next 21 days & invite others to join you! It’s always more fun with friends. 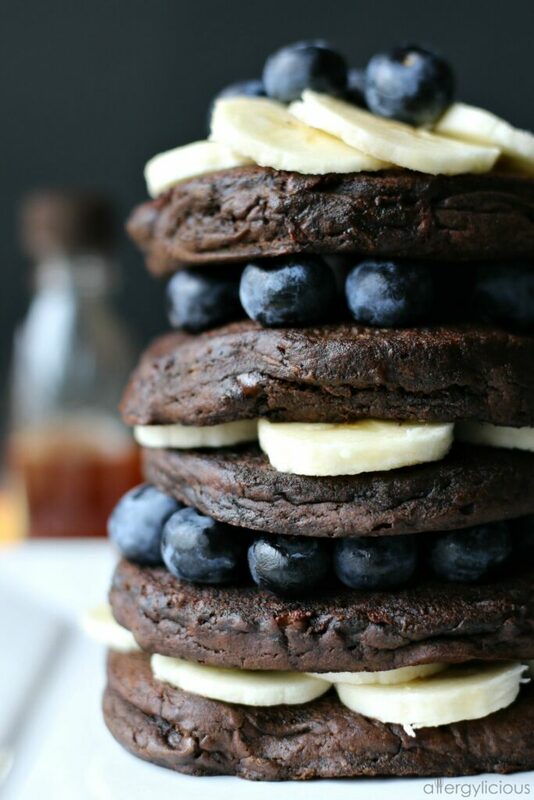 Healthy DOUBLE chocolate pancakes that are allergy-free? Don’t mind if I do! These look super fluffy and delicious ! Pancakes aren’t pancakes with out the chocolate involved! These look so good! 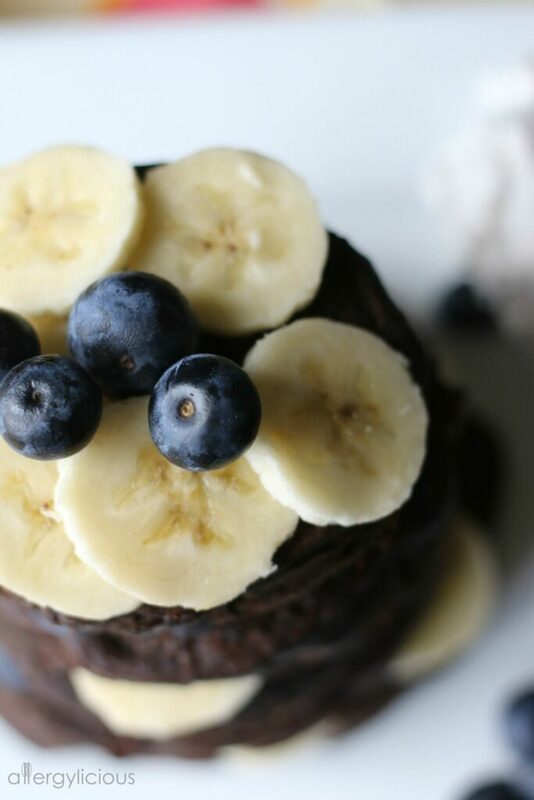 If you can believe it, I’ve never had chocolate pancakes before – I’ll have to make these soon! Never? Oh my! If you like chocolate, you’ll love these. I really love adding fruit as my topping, it just balances out the sweetness. My boyfriend is going to go crazy for these pancakes! I haven’t had pancakes in ages! 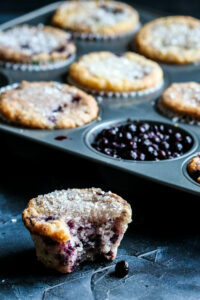 This is so going to be made for breakfast this weekend! Glad to get you started back on pancakes :). We only get to do them when we have a morning everyone is home, but I love mixing up our Friday night dinner and making breakfast instead. A perfect place to throw in some pancakes. OMG!! these look and sound so so very delicious! I always love a good chocolate pancake! My husband would swoon over these! It’s been years since I’ve made chocolate pancakes and they may need to happen for Valentine’s Day! He’s a chocolate lover? Yay 🙂 My hubs isn’t but the kids are, so we just eat the extras.